The MMR titer is a blood test that checks for immunity to measles, mumps and rubella. Also known as an MMR test, the MMR titer measures IgG antibody blood levels to check if the immune system can protect against an infection from an MMR component. What is an MMR titer? An MMR titer is a blood test that measures the measles, mumps and rubella IgG antibody blood levels. Why is an MMR blood test important? An MMR test is commonly used to check for MMR immunity by students and employees who need to prove MMR immunity as part of compliance requirements. This MMR Titer is a blood test. The MMR titer, sometimes known as an MMR immunity test, MMR test, MMR blood test and an MMR lab test, measures MMR blood IgG antibody levels to check for MMR immunity. MMR is an acronym that represents three different types of contagious infections - measles, mumps and rubella. While caused by separate types of infectious agents, these three infectious are typically lumped together because they are preventatively managed with the single MMR vaccine. Because they are commonly encountered in healthcare and school settings, proof of MMR immunity through the MMR blood titer test or documentation of MMR vaccination is frequently required by schools and healthcare organizations. The MMR titer is frequently ordered with the hepatitis B titer and the varicella titer, all of which are part of the immunization titer panel. When people also need tuberculosis screening, the QuantiFERON test is often added as well. The MMR titer is used to check for MMR immunity through measuring immunoglobulin G (IgG) blood antibody levels that protect against the three types of infections. The most common reason that someone might already have MMR immunity is because they previously received the MMR vaccine series. The MMR vaccine series is routinely given to children in the United States and in many other places. The MMR vaccine is a weakened live virus vaccine that gives the recipient a very mild case of each infection. In doing so, the immune system "learns" what measles, mumps and rubella infections look like and generates memories of them that usually lead to MMR immunity. If one is exposed to measles, mumps or rubella after a successful MMR immunization series, the body can mount an effective IgG antibody response that immediately clears out the infection. For many people, receiving the MMR vaccine series can confer lifelong immunity which can be measured by performing and MMR titer antibody blood test. Infrequently, another reason someone might have MMR immunity and a positive MMR test result is because they were actually infected by mumps, measles and rubella in the past. With the widespread adoption of the MMR vaccine, it is unusual to find someone who had all three MMR infections and recovered. Should this be the case, the body's immune system typically develops native immunity which is protective in case one is exposed to one or more of the MMR infections in the future. If one is getting an MMR titer to check for immunity, they have presumably recovered from all three infections and should demonstrate immunity in their blood titer results. And so, this MMR titer is designed to check for MMR immunity by measuring the IgG antibody blood levels for the three MMR components - the measles titer, mumps titer, rubella titer. Typically, the gold standard MMR titer is a quantitative, or numerical, titer that reports an actual number result as opposed to positive (reactive) or negative (nonreactive). Getting an MMR titer test near you is relatively straightforward as any standard Quest Diagnostics lab location has the necessary equipment to run the MMR test after the blood has been drawn. MMR lab results come back fairly quickly and the results are not difficult to interpret. In looking at the sample MMR lab test report provided above, the IgG antibody levels for measles, mumps and rubella are reported as numbers in the results column. Under that is a reference range provided by the lab that includes a value and interpretation of the value. If the IgG number reported falls with the positive range, that means one is immune to the MMR component being reviewed. If one is negative that means that one is not immune and, in most cases, will need to get the MMR vaccine series again even if two out of three come back with immunity. An equivocal MMR titer component result generally is interpreted as negative (i.e. requiring the MMR immunization series) although some people might consider repeating the MMR blood test to see a second lab result shows a clear positive or negative MMR titer. In the absence of MMR vaccination documentation, many people still opt to get an MMR titer test before getting the MMR vaccine series again. The reason for this is that the MMR vaccine, as mentioned, is a weakened live virus vaccine and there is always a risk of getting sick from a live vaccine. Additionally, the MMR vaccine series requires two doses spread out by twenty eight days which adds extra cost and inconvenience to the MMR immunity process. If you are looking for other types of titer tests, please see our titer test page. For compliance purposes, a 10 panel drug screening test is sometimes needed at the same time as MMR titer results. 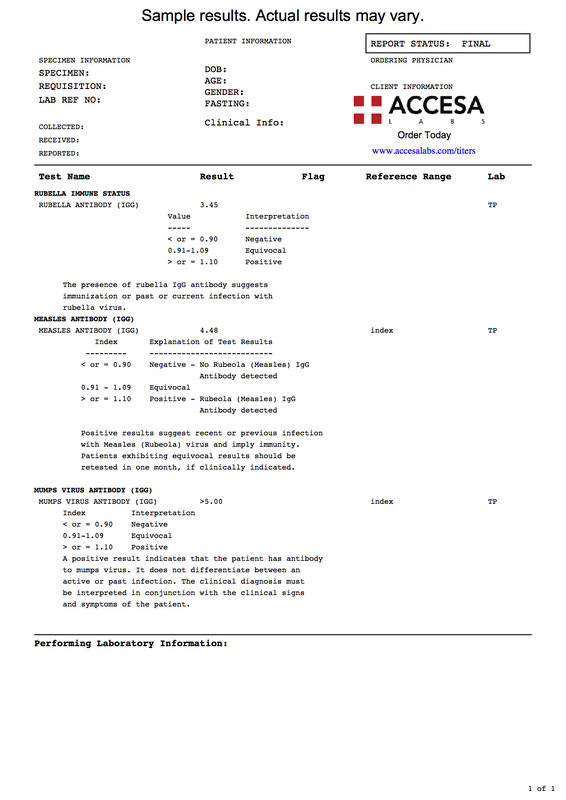 We hope you found this MMR test report review helpful. MMR Titer at Guaranteed Prices.